I got the pic from Amazon. Please don’t sue me, I am poor. This book was recommended to me by a friend around 2007. A highly educated friend who makes a living as a writer of actual books and who won prestigious awards the years that followed. I trust his taste a lot. Thanks to him I have read many wonderful books, none of which was what you would call “easy” reading. 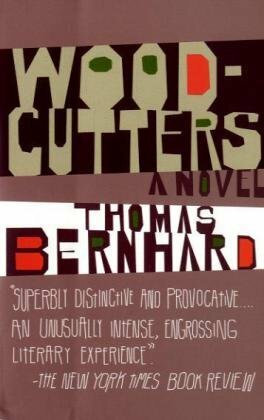 Somehow, I have failed to purchase the “Woodcutters” all these years. Last summer we looked for them back in Greece, but the bookstore only had “The Voice Imitator” by Bernhard, which is a great collection of dark, cynical stories, filled with bitter humor. This summer we managed to find the “Woodcutters” and I was quite excited about it. However, since last summer my IQ has dropped significantly, along with my attention span, due to having a child and reading way too many articles about baby sleep patterns and the best way to tie a woven wrap. My opportunities to read for more than 10 consecutive minutes are pretty rare as well. Therefore, it took me about two months to finish a book that has exactly 237 pages in the Greek version. I did not enjoy it. However, I insisted on reading till I reached the last page. Why did I do that? First, because I hate leaving books half-way. And secondly because that book is actually interesting. Enjoyable? Not particularly. Interesting? Yes. As I mentioned, I read the Greek translation. I hated it. But maybe I would find the literary style equally annoying in the original language. I have no way of knowing. Once I got used to the language/style (after about 50 pages), I was finally able to focus more on the plot/ideas of the book. The book is about a fancy “artistic” dinner in honor of a famous theater actor, hosted in Vienna by a mediocre composer and his wife. The narrator is a writer who has lost contact with the couple and meets them again after 20 years, as they all attend the funeral of a common friend of theirs. The whole book is a description of the dinner and the thoughts of the writer. It’s as if we are reading his thoughts and travel with him to the past, through his memories. One by one, we get to know the characters, their relation to the writer and why he hates every single one of them. The book is a critique against people who want to have the “artist” title, without actually creating or even respecting art. I am pretty sure that the general grumpiness and cynicism of the main character, along with the ridiculous behaviors of some of the dinner guests, are supposed to be also funny, but I didn’t smile throughout the whole book. I found myself constantly thinking that I wouldn’t be able to stand this person in real life, no matter how much wisdom they carry. The writer finds the young immature, the old bitter and angry and stubborn, the actual artists hopeless and the phoney artists unethical and he does not even like himself. I did. I liked how the writer describes how we often find ourselves trapped in social circumstances and end up spending our time with people we find toxic or simply can not stand. Especially at the end of the book (no spoilers) I really felt for him as he treats a person he really hates (that’s the word used in the book) as if he really cares about them and wants to see them again and he knows he is lying but he can’t stop himself from saying the things he does. It happens to me much more often than I would like to admit. And I guess that many tormented penniless artists find comfort in the book, as it describes how people with power and money and social influence get the glory and not necessarily the truly talented. Does the book propose a solution to this great issue? No, but at least it raises awareness. I also found fascinating how actually talented people get sucked into the system, in hopes of earning a decent living and enjoying a financial security. And in this warm and cozy secure environment, their talent dries out, due to lack of inspiration or motivation (or both). I ‘ve seen it happen. It’s not nice and I also think that the Universe is a bit cruel, charging inspiration for comfort, but it does happen way too often. Would I suggest you to read the book? Strangely enough, yes. And not only because I want you to suffer through it the way I did. But because I do actually think it contains some interesting ideas or, to be more precise, emotions. However, I do not think I am going to read it again or buy it as a gift for friends. This is the kind of book that I would gladly get from a library. ← Using Cloth Diapers: 6 months later. Pros, cons, tips and tricks. Oddly, this book sounds really cool. Thanks for the thoughts! If you’re ever interested in some other great book reviews and musings, be sure to follow! Thanks!! !